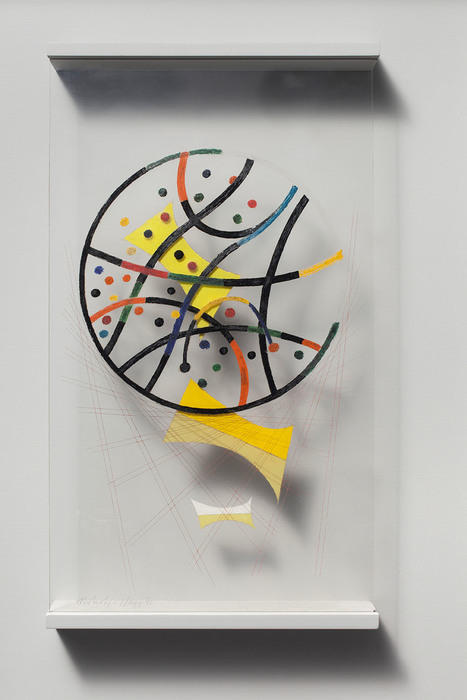 The Paintings of Moholy-Nagy: The Shape of Things to Come puts forth a unique take on Moholy-Nagy's painted work with the incorporation of two interventionist pieces by other creators and a smattering of his own theatrical and photographic works. Due to the technology-based works’ expense and inherent complications, Moholy-Nagy reinvestigated painting as a medium to explore light and optics, while still drawing inspiration from these periodic experiments with other media. Perhaps somewhat misleadingly titled, as there are several stand-out non-painted works, the exhibition serves as a survey of an artist as innovator who welcomed technology, even though many of those that Moholy-Nagy used seem quaint, ordinary, or are obsolete today. Popping with opaque red, yellow, and white, Q features a strong, graphic composition though faint pencil markings leave a human trace. Fine lines fill in a vertical rectangle, inviting a closer look to find the nuance, to find carbon. Permeated with subtle ripples, its dark nature is rich, deep, and black with the strength of its colorless intensity undermined by its fragile paper-thin structure. Made redundant by technology and time, this once prevalent, mundane office material shows its half-life. As a material of transfer turned dormant, Moholy-Nagy renders it useless, but reimagines it truer to its original purpose as a substrate at the base of things. In AL3, rigidness decomposes with the materials: industrial paint and aluminum. Mirrored by the swift degradation of a initially perfect-finish-sprayed blue hue to a dingy, faded, greenish gray, the work unintentionally hints at industrial materials’ destructive potential (for warfare, etc.). Painted, layered orbs obfuscate off-center, static see-saw planes, hiding them behind a pupulic, red spot. Its blood-tinged nature is reminiscent of Phobus passing the sun as a ring eclipse: something attractive, scary in its unknownness, and ephemeral—a state rarely seen and soon forgotten. Two slippery materials, oil paint and Plexiglas, are made one through a force against the nature of their inherent properties. This material coercion underpins Untitled Space Modulator’s joy-filled romp of planetary polka dots and emulated orbital trajectories that are not quite graceful in their cloying thickness—a hindrance to any implied momentum. Beneath, floating yellow and white planes and rust brown, oil-incised lines create perspective. As light hits these blocking paints, it leaves feathered, enlarged shadows bleeding into the background behind the Plexiglas; with softened edges, the shadows lack detail, much like light through transparent film results in photo enlargements of a process-altered, edited life. Composed of mock translucent layers upon layers, C H for Y Space Modulator blends pieces together to create harmony and whole out of difference. As if they were colored filters, each affects those below it by lightening and darkening tones and shifting hues to emulate light effects with paint. Corralling these small curls are red and green, squarish, gel-filter-holder-like frames with egg-shaped openings gravitating toward the edges of the Formica base—the shocking yellow of which remains the hue of greatest impact, but regardless appears unable to affect the lilting oil above. Alex Rasmussen’s heavy metal, aluminum scrim intervention features an etching of Moholy-Nagy’s grayscale Photogram (The J. Paul Getty Museum 84.XM.231.4) comprised of bullet-style punctures. Its weightiness implies an indestructible thing and yet it is also a penetrable thing, which emulates the photogram process where light penetrates and surrounds physical items leaving an impression of shape and tone behind. Honoring his experimentation with industrial materials and light, this baffle wall is an homage to Moholy-Nagy and the dramatic framework that creates a tease for the view of his lauded work Light Prop for Electrical Stage. Though constructed in an era when machines were big, bold, and often unattractive, Light Prop for Electric Stage, a compositional delight of random parts: of swirly gigs and chain, of screens and whatchamacallits, belongs with small scale, delicate showpieces. Due to expense and complexity, this prototype for theatrical applications never worked reliably. The prop’s flawed, underwhelming performance of stops and starts, of unboxed, unsustained light throwing, mutates its function from creator of an immersive environment to a “sculpture of wonder,” a dazzling curiosity in its slick, confined, kinetic space. 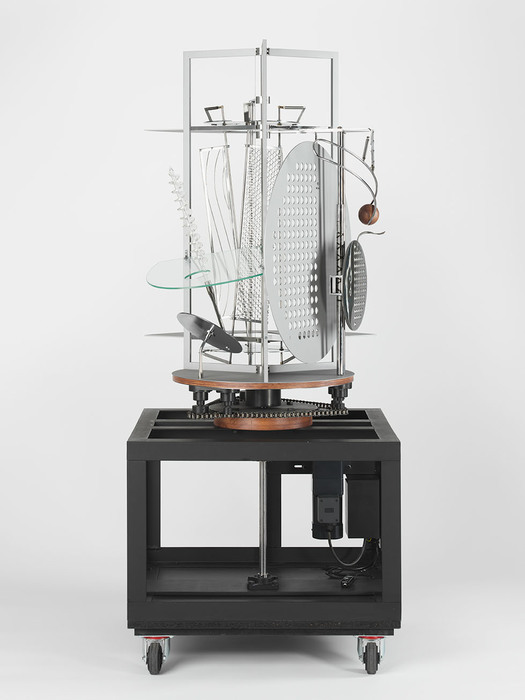 The contraption whirs softly while occasionally creating architectonic-shaped, subdued shadows, each shuddering, floating and adapting to time-based changes in solidity. Now this creation moves on as a mechanical wonder of age both adapting to its altered status as art object for display and instilling a frail lingering hope that it will produce astounding, futuristic effects the likes of which have never been seen. In his short film, Ein Lightspiel: Schwarz Weiss Grau [Play of Light: Black, White, Gray], Moholy-Nagy gives us Light Prop’s negative*, with a focus on the mechanical parts’ wondrous movements in place of projected shadows and light play on the wall. 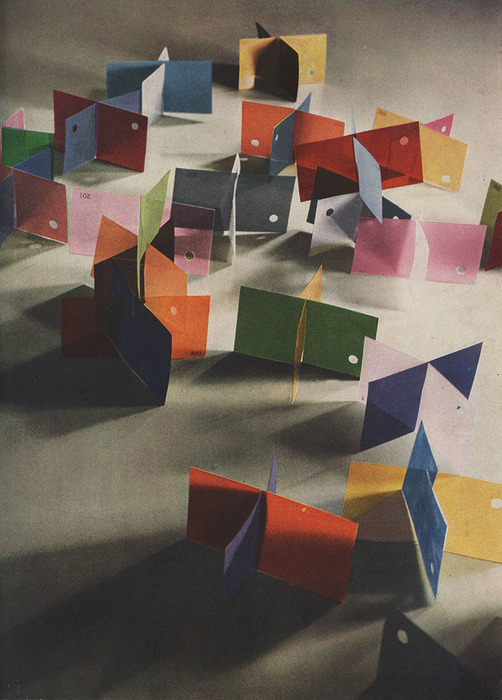 A small collection of photograms, film stills, photographs in print, and color slides round out Moholy-Nagy’s supplemental works. The color slides are abstract compositions based on manipulated elements from his surroundings, often changed slightly beyond common recognition by moving the camera or light source while capturing the image. A mix of slinky red and saturated yellows lights, auto headlights, light drawings, and more, these methods for creating abstractions are commonplace to us today, but in the early years of color photography were still fascinating and unusual ways of working. The photograms too seek to distort objects into more obtuse, unrecognizable shapes, but can be discerned by a careful observer. Another intervention, Jan Tichy’s Things to come, plays a mesmerizing loop of footage, which revisions Moholy-Nagy’s proposed work for the same-named, H.G. Wells’ film. In this celluloid daydream, tethers control the movement of shifting planes of Plexiglas as they interplay with round-hole-riddled metal rectangles. Complex Erector Set structures, reminiscent of modern apartment buildings, stand stoically as off-kilter cones whir on fragile points. Disorientingly projected upside down with mirror reflections combining and splitting shapes again and again, the optical experience warps as globes liquefy and refract light. On the single channel, in between each segment, Moholy-Nagy emerges only for a moment to be drenched again in Tichy’s operatic evocation of his spirit. 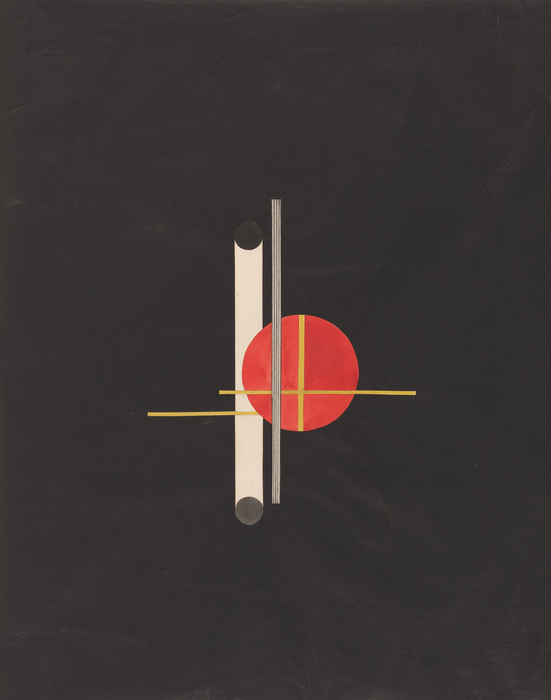 Some of Moholy-Nagy’s experiments are failures, but in as such are in fact successes for they speak to the very essence of experimentation where failures are a form of positive data. His ambitious adoption of modern materials led him to miscalculate longevity, to innovate ways for mediums to work together despite incompatibilities, or change original intention in response to the transformation of the works. By embracing material advancements, Moholy-Nagy reminds us of the allure of the new, the potential dissatisfaction of hindsight, and yet ultimately the beauty of uncontrollable outcomes. * A reference to a photographic negative. 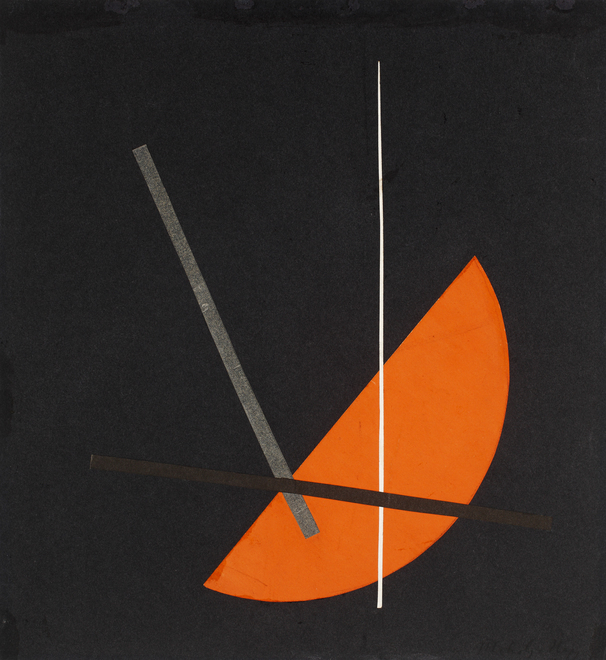 The Paintings of Moholy-Nagy: The Shape of Things to Come is on view through September 27, 2015 at the Santa Barbara Museum of Art. To see Light Prop for Electric Stage working, a schedule is available online. Kimberly Hahn is an artist, photographer, designer, and independent writer based in Santa Barbara, CA.